Here is an update from the Northwest Leadership PAC on the lack of paid sick leave in Spokane and work on the issue by City Council. Currently, about 40,000 workers in Spokane lack earned sick and safe leave- risking the health and safety of themselves, the public, and their families. Access to earned sick and safe leave reduces employee turnover, protects the safety of domestic violence and sexual assault survivors, increases employee morale and productivity, and ensures workers don’t spread illnesses. Mike Fagan‘s eighth man circus has caused another ruckus. I support what Councilman Jon Snyder wrote about it. Still, there is a lot of confusion about what free speech really is. The City Council did not ban any words the other day, and it is hyperbola for KXLY to claim that it did. A TV station should have a better grasp of the legislative process and what the word banning really means. If I want to, it is within my personal 1st amendment rights to ask you to stop talking. I most likely would not do that, because it is a bit overbearing and disrespectful. 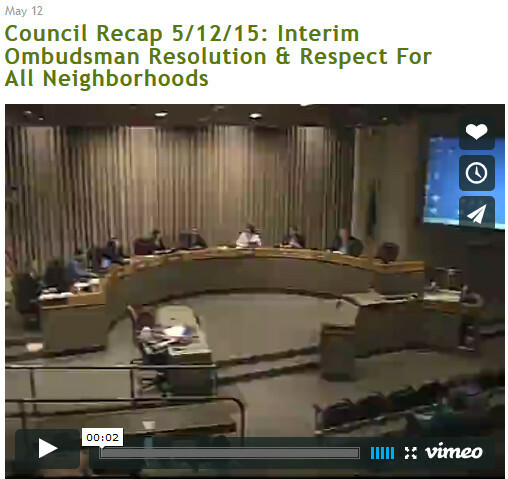 However, it is also not even what the Spokane City Council did the other day. I might, however, ask you not to use a word that I consider offense or respectful. Freedom of speech is not restricted simply because someone is advised not to use a word. It is their right to ask you, and it is your right to ignore their request if you choose. Spokane Launch of Wamend’s Initiative 735: Get BIG Money out of Elections! 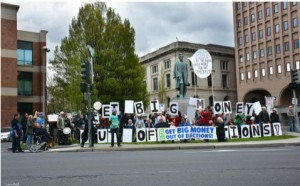 (By Stacey Cossey) Saturday, April 25th marked the launch of Wamend’s Initiative 735: Get BIG Money out of Elections! Over a hundred Spokane and Northeastern Washington citizens took to the streets to protest the ‘big’ money that is flowing into our political system, influencing the outcome of our elections. 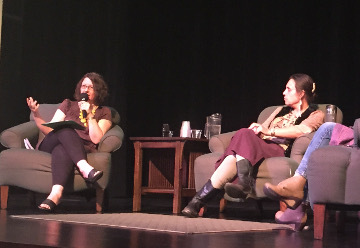 Winona LaDuke, Native American leader, spoke about political and spiritual solutions to our world’s problems in Showalter Hall at the Cheney campus of Eastern Washington University today, Wednesday. Winona LaDuke is a well-known internationally recognized Anishinaabeg (Ojibwe) author, speaker and activist. She was joined by Liz Moore, an engaged local activist from the Spokane area. Liz is the Executive Director of the Peace and Justice Action League. The speakers and audience explore questions and told stories about outreach to diverse communities, building alliances and partnerships for effecting social change, spirituality, and ways to learn from each other. They questions aimed at examining the challenges of advocating for social justice and organizing for social transformation in different cultures and environments.